Archbishop Williams is pleased to welcome 7th and 8th grade students to campus for the 2014-2015 school year, transforming AWHS into a 7-12 college preparatory school. 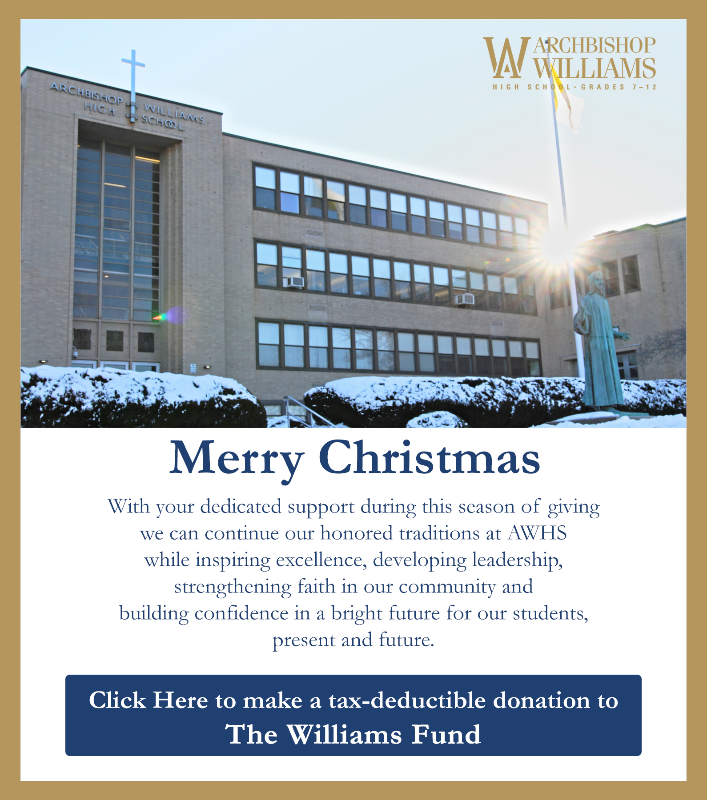 Archbishop Williams is provides the first and only co-educational Catholic 7-12 high school in the area. "Futures Begin at Williams..." Futures begin in faith. Futures begin in the classroom. Futures begin on the field. Futures begin with involvement. Futures flourish after Williams. The 7th and 8th Grade program is designed to prime students for the important transition to our high school curriculum. We are confident that our environment of respect, trust, support and learning will allow our students to reach their potential while enrolled at Archbishop Williams and beyond. Please see the list of frequently asked questions below and contact the Admissions Office at 781-535-6051 with any questions. Why attend Archbishop Williams for grades 7 & 8? Archbishop Williams High School will provide a scholastic, social, spiritual and safe foundation upon which students can build a successful career at a rigorous college preparatory high school. Our 7th and 8th grade students will be taught in the same top-notch labs and technologically advanced classrooms as the 9-12 students. Every student at AWHS will utilize iPad technology on a daily basis in their classroom studies, for notetaking, and projects. Archbishop Williams 7th and 8th grade is the first and only Catholic co-educational program offered to students on the South Shore. When can students apply for the 7th and 8th grade? The Admissions Office will accept applications for both grades 7 and 8 for the 2015-2016 school year starting in the fall of the prior year. Students applying to Grade 7 & 8 must register and complete the Independent School Entrance Exam (ISEE). Applicants will be required to submit report cards for 5th and 6th grade and a personal essay. Applicants must also submit their disciplinary record and standardized testing scores. The 7th and 8th grade students will study the same core subjects as students in grades 9 through 12. Beginning in the 7th grade, students will take Theology, English, Science, Math, Social Studies and foreign language. Seventh and 8th graders will also take Art, Music, Physical Education, Health and study skills. The 7th and 8th grade curriculum will provide a sturdy foundation for all aspects of our 9th grade curriculum in an experiential and interactive environment. See what A Day in the Life of a 7th & 8th Grade Student will be like. What campus resources will be available? The 7th and 8th grade is located in the high school's main building. The location provides a neighborly community for 7th and 8th grade students while offering them access to all of the high school’s facilities including the gym, auditorium, cafeteria, chapel, campus ministry center, science labs, library and computer labs. Students in the 7th and 8th grade are required to wear a uniform similar to students in grades 9 through 12. Students wear light blue shirts and navy blue bottoms. Will students in grade 8 automatically be accepted into grade 9? Eighth grade students in good standing will be enrolled into grade 9. Matriculating students will take the HSPT entrance exam for merit scholarship and placement purposes. May an accepted student defer his or her acceptance until the 9th grade? Yes, a student accepted into the 7th or 8th grade may choose to defer his or her acceptance until the 9th grade assuming he or she maintains an acceptable level of academics and disciplinary record. What co-curricular opportunities will be offered? Students in the 7th and 8th grade are represented by a Student Government Association serving each grade, and will be eligible to earn membership in our National Junior Honor Society. The 7th and 8thgrade students will also have access to our drama program, chorus, intramural athletics and clubs. What sports will be offered? Student-athletes in the 7th and 8th grade are eligible to participate in the Archbishop Williams athletic programs, which encompasses 24 sports and 48 teams, at the appropriate level. Tuition for students in grades 7 and 8 is offered at a reduced rate of 85% from those students in grades 9 through 12. Merit scholarships and financial aid will be available to qualifying students. You can learn more about our 7th and 8th grade program by attending our Open Houses on October 19 and November 6 or by calling 781-535-6051 or emailing the Admissions Director, Michela Schuster at mschuster@awhs.org.